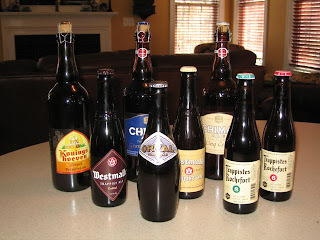 After being delayed by a busy schedule, we're about to get underway on our exploration of Trappist beers. Pictured here are the beers I have lined up so far. If time allows I'd like to fill in a few missing pieces, but there's enough to start with. But where to start? The order will be dependent on my mood at the time. First up I think will be Orval. I've been wanting to try this one for some time, just never got around to it. If you follow along, be sure to check out the links that will be provided for the monestaries and breweries. You'll learn more about the people and processes behind the beer. They all have fascinating histories. Understanding where the beer comes from will surely enhance the pleasure of drinking them. You really can't go wrong with that Chimay White. I had it about 6 months ago at Taco Mac (wonderful drinking establishment) and I was impressed. I actually have that in my line up as well as the blue and red. I will be interested in what you have to say about it.